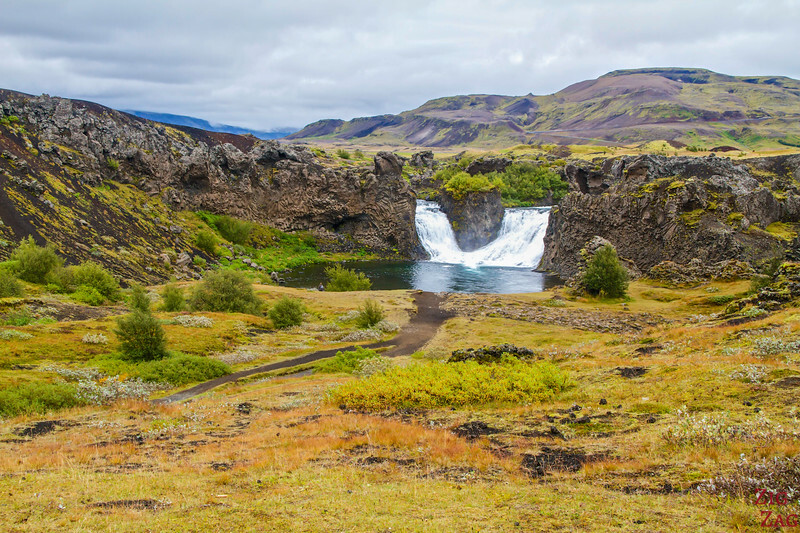 As you get closer to the Central Highlands of Iceland, North of Hekla, between road 26 and road 32 flow several waterfalls. 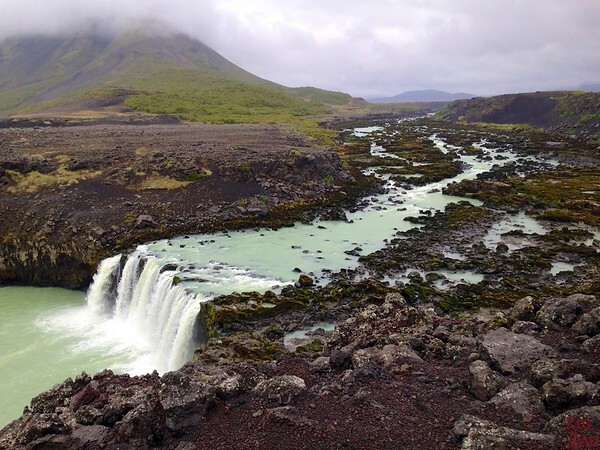 I had the chance to discover 2 of them: the double branched Hjalparfoss and the purple Thjofafoss. Both are stunning and deserve a stop if you drive by. Attention: although 5km apart via the river, the drive between them is way longer. 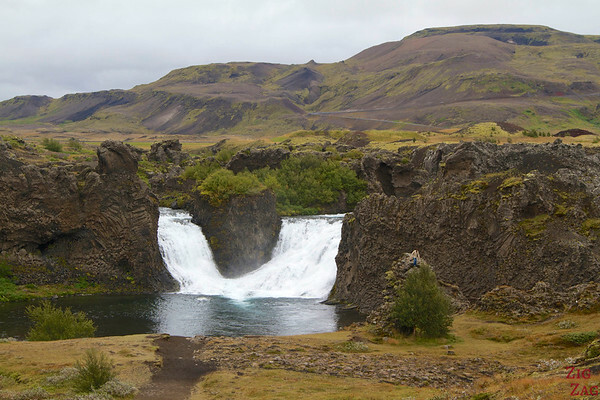 Hjálparfoss, whose name means Helping Falls, is one of several waterfalls north of Hekla where the rivers Fossá and Þjórsá join. This easy accessed one is special due to its double branch flowing into a large pool and surrounded by interesting lava shapes. 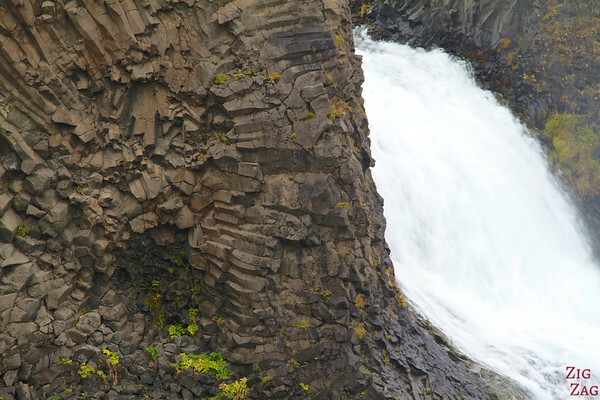 Hjalparfoss about 30 kilometres east of the village Flúðir. The gravel road to the waterfall is well indicated off Road 32. 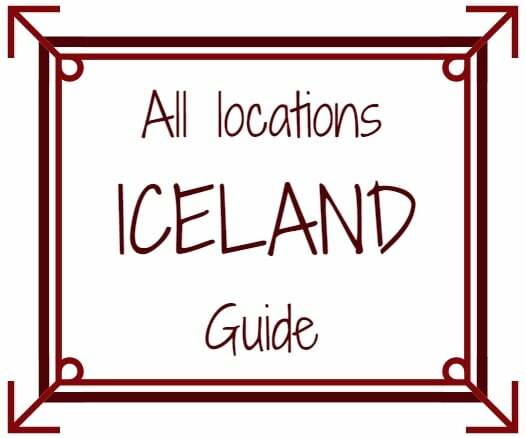 Hjalparfoss is included in the Travel guide Experience Iceland that I wrote to help you plan your road trip around Iceland and make the most of your time. Learn more on this page. The pictures below highlight the easy path to the pool and some close-up of the lava formations. Everybody rushed to get closer but personnaly I prefered the view from the parking area. 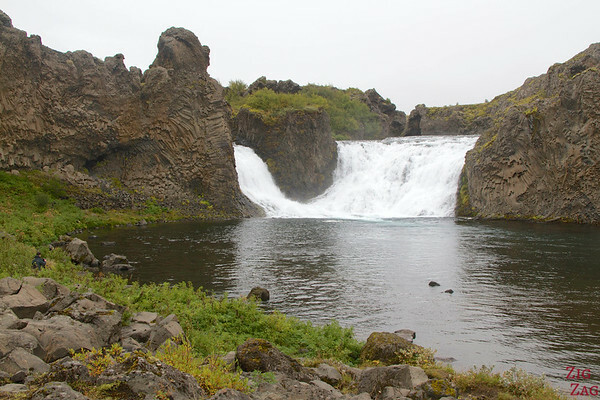 Þjófafoss (Thjofafoss), whose name means Thieves fall, is another waterfall on the river Thjorsa. Its shape is not very original as it is a simple curtain but the surroundings makes it interesting. Mt Burfell is just behind and really stand out in the flat landscape. But my favorite particularities was the abondance of purple lava rocks around it. This is something I have not seen in another Icelandic waterfall. On route 26, turn West on a sand road for roughly 4km. THe turning point is about 45km North of the crossin with Road 1 and 20km South of the crossing with Road 32. The coordinates are 64.056858, -19.867044. Below are 2 shots of Thjofafoss. The first one features Mount Burfell, a table volcano which is 669m high. And on the second one, you can really notice that the rocks around it are purple. Would you take the detour to see them? I don’t think it is possible; this is pretty wild there and with volcanic soil. It seems there is a track on part of it but not the whole way. However I am not a hiking expert at all so I can’t tell you for sure. I may ask around when I get there and see how it goes, otherwise I’ll just drive around to the south side. Thanks for the help!